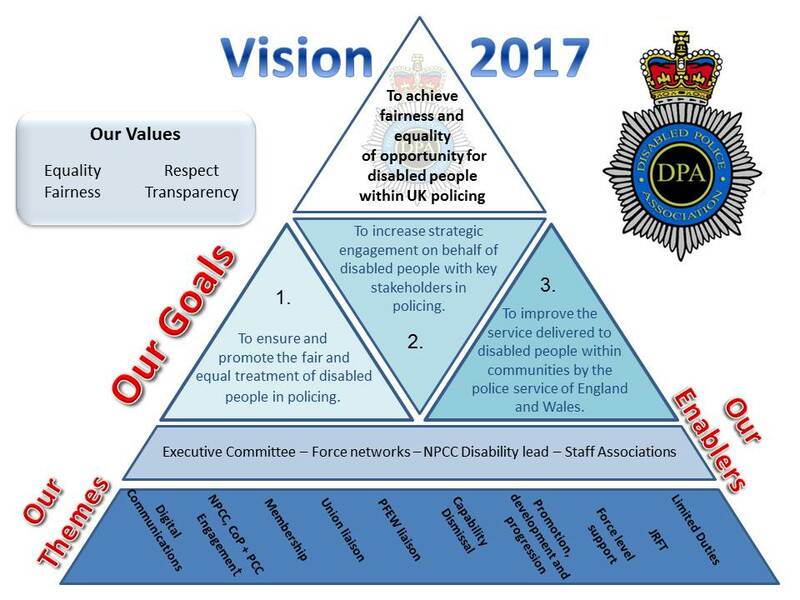 Today the Disabled Police Association (DPA) has launched its strategic vision for the coming year, setting out how, as a staff support association, they will champion fairness and equality for disabled officers and staff within UK police forces. The Disabled Police Association, which launched in 2012, functions without any central funding or budget and is formed of officers and staff who carry out their duties in addition to their full time policing roles. The Disabled Police Association operates as the strategic coordinating body for locally based force disability support groups, engaging with key strategic partners such as NPCC and the Police Federation of England Wales. The Disabled Police Association, whose goals include promoting fair and equal treatment of disabled people in policing, have consulted and provided specialist advice to the Home Office and NPCC on matters such as Limited Duties and Capability Dismissal Regulations and have worked with the College of policing on their Valuing Difference and Inclusion Strategy. In 2017 the DPA will continue to support officers and staff up and down the country, working with key private sector organisations and charities such as Remploy, Purple Space and Disability Rights UK to provide better support on matters such as mental and physical health and fair treatment in the workplace. Jamie Mills said: “The DPA have already built up many good working relationships within policing, such as with chief officers like DCC McCormick of Cheshire Constabulary, the NPCC lead for disability and with others in the public and private sector. 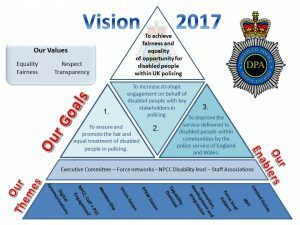 However, this year we would like to see a greater importance placed on disability related matters in policing to increase the support and opportunities provided to disabled people. This can be better achieved by supporting force level disability support groups. “Staff networks play a vital part in making sure we can enable all colleagues to flourish in the workplace. One of the key roles of the Disability Police Association, through its membership across forces, is to help us understand and remove barriers – so that the police service is an attractive and inclusive profession where diverse talent is encouraged and supported.